The last time that I had visited The Walt Disney World Parks was almost 20 years ago. I just finishing high school and I came to Disney as a last hiatus before entering the adult world. This time I was returning with my husband, mother, and six children with expectations to find the same ol' Disney. All week leading up to our arrival at Walt Disney World my children were as I remember myself, beaming with excitement and anticipation. I began to live again in their moment, vicariously through their expectations. But, the Disney I found was not the Disney that I had left. 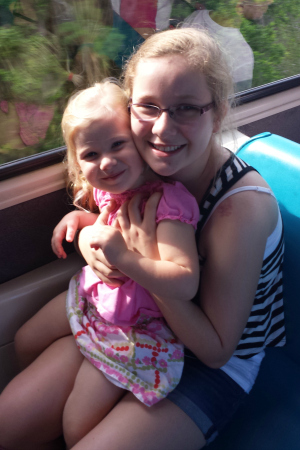 On the morning of our arrival, we took the monorail to the Magic Kingdom Park. Our enthusiasm grew as we drew near to Cinderella's Castle which we could see out the monorail windows on the horizon. 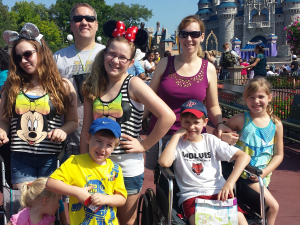 Upon entering the Magic Kingdom, we found the conveniently located wheel chair rental facility--which was needed due to an injury one of the children incurred at a hotel the day prior. This unusual turn of events made us appreciate the park's accessibility for wheelchairs and strollers as we were now pushing both! We continued our enchanted journey along Main Street U.S.A. and stopped to watch the Dapper Dans dance and sing on a street car trolley. We were whisked away back to 20th century Americana. The show sent my seven year old spinning and dancing the rest of the day. Along Main Street U.S.A. there were ample opportunities for the iconic family Disney photo with the castle effortlessly framed in the background. After several photos we moved on to Tomorrowland, stopping at a conveniently located Fast Pass Station (look for FP+ symbol). 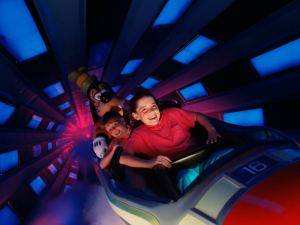 Disney's Fast Pass enables you to preregister for rides and attractions and then provides a time slot for you to arrive at the specified ride or attraction, bypassing the normal line. 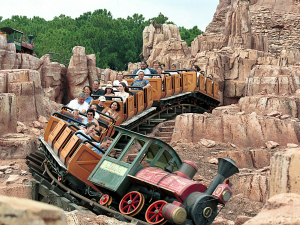 Some of the more popular rides at Magic Kingdom may have waiting lines over an hour. 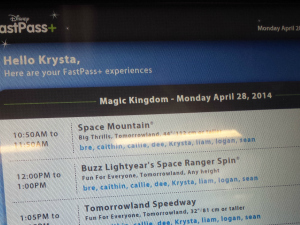 Fast Pass allowed us to conveniently plan our day. TIP: We used the Fast Pass to preregister for the busier rides and then attended the less busy rides and attractions in between our Fast Pass Time slots. TIP: It is a good idea to know the height of your younger children before you register for the rollercoaster rides, which have a height requirement of 40-44 inches. This was a disappointment to our Ginny (2) and Liam (4). 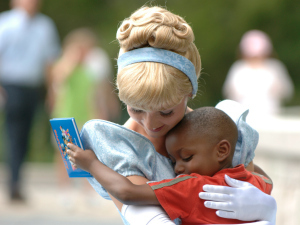 Disney offers a rider swap for families with younger children. Upon checking in, ask for a riders swap ticket. The adult that waits with the younger kids can hop right into the Fast Pass line with up to two people--without waiting in line again once the first group has completed their ride. This worked great for us on Space Mountain as Liam didn't meet the height requirement. I asked for a riders swap ticket and stayed with him while my husband took the older kids. When they finished riding, I hopped right in line with two of my other kids. An ideal solution as no one, except our cute little 2-year-old who didn't notice, was left out. 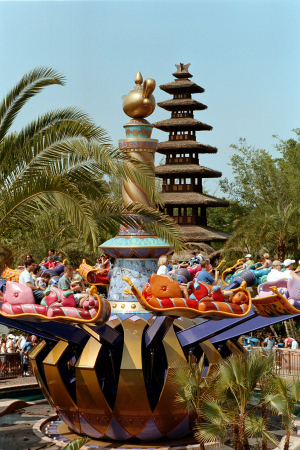 Tomorrowland had many engaging rides and attractions and was a terrific first through the Magic Kingdom. All nine of us (from 2 to 55!) had a ball on the Buzz Lighter Space Ranger Spin Ride. Our Liam (4) was in Heaven helping Buzz defeat the evil Emperor Zurg. After Tomorrowland, we moved on to Fantasyland. Fantasyland is where little princesses will be able to meet and greet their Disney Princess heroines and offers the most rides and attractions for kids six and under. But honestly, Callie (11) and Bre (14) also enjoyed this area of the park. 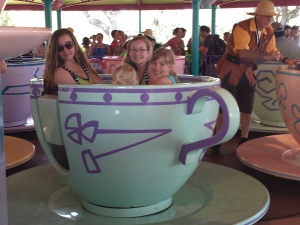 Callie admitted to feeling like a princess in Fantasyland and Bre loved It's a Small World! TIP: Start in Fantasyland if you have mostly preschoolers. 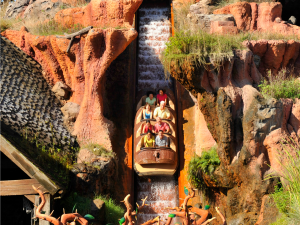 Fantasyland leads into Frontierland, where you'll find the longed-for water rides on a hot afternoon. 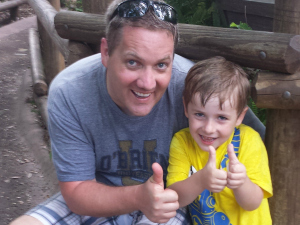 Logan (9) insisted on re-riding Splash Mountain over and over again. His goal was to discover which seat will ensure you get the wettest. We rode Big Thunder Railroad in the evening and found the ride thrilling as we zipped up and down with the lights of Magic Kingdom dotting the sky. TIP: As I waited for my husband and older kids I found a great little playground for our two-year-old under the Railroad by the exit of Splash Mountain. It was already 9 pm by the time we finished in Frontierland, so we grabbed seats along the road and caught the Main Street Electrical Parade. That was enjoyed by one and all! Then we headed straight for the castle to watch Wishes Nighttime Spectacular and fireworks. "Wow!" was all we could utter as we beheld the magic created as the castle was lit with characters, drama and songs. Spectacular is an understatement for the creative entertainment produced. 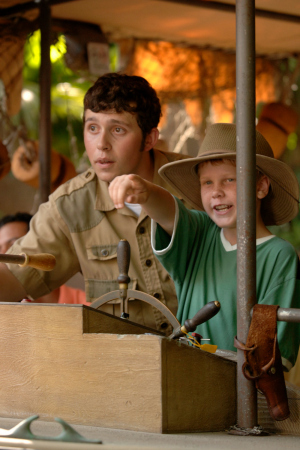 By this time, most of Disney's guests were headed home after the show but we still wanted to check out Adventureland. This is home to so many fun rides and attractions for all ages. We grabbed a quick ride on the Jungle Cruise and my husband and I were entertained by the hilarious tour guide, while our children giggled at the baby elephants and other animals. After the cruise we all enjoyed The Magic Carpets of Aladdin. Since it was the end of the night and the park was near empty we rode that ride at least four times due to our sweet little 2-year-old's urging, "one more time, pleeeaaasse!" At the end of the day, we were happy, exhausted, and already dreaming of when we could return to 'the most magical place on earth.' 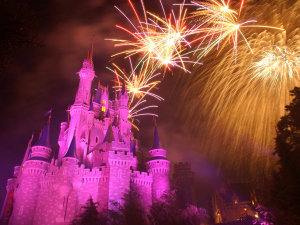 Walt Disney World delivered magic, adventure, and excitement, just as promised. Somehow it retained the nostalgia we all remember while creating a fresh, contemporary experience. In April 2016 the Crew returned to Disneyworld Florida and toured Hollywood Studios. Click to read their recommendations for a multi-generational family vacation. Make your Fairytale dreams come true. 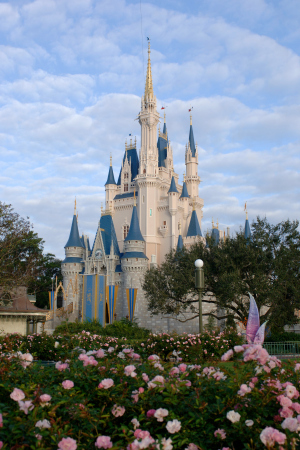 Click on the link above to purchase tickets or book your Walt Disney World Resort hotel. Krysta O'Brien has toured the country with her writer/photographer husband, Sean, and their six experienced travelers: Breanna (14), Callie (11), Logan (9), Caitlin (7), Ginny (2), Liam (4). Krysta's goal is to provide parents with inside tips, learned from experience, to make others' journey easier. The O'Briens visited Walt Disney World Magic Kingdom Park® on April 28, 2014.